Authorities are looking for two men who knocked a 28-year-old woman unconscious and beat up her boyfriend in a Bronx subway station last week. 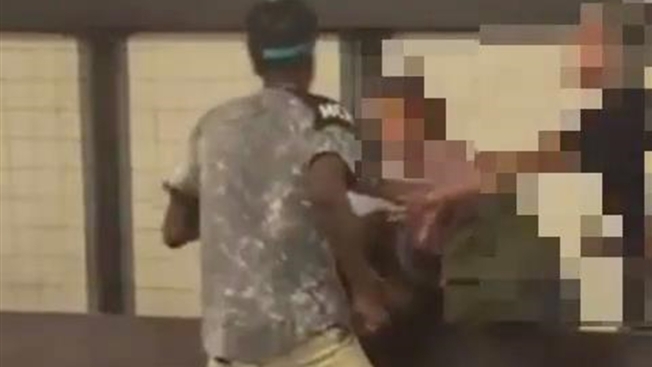 Police say the suspects were harassing the woman in the Grand Concourse station on Labor Day. Her 21-year-old boyfriend intervened, and one of the suspects put him in a headlock while the other beat him up. When the woman tried to stop them, one of the suspects punched her in the face, knocking her out. She had cuts to her face from the fall to the ground, and her boyfriend suffered several facial fractures. Police released surveillance video of the attack that shows the boyfriend pinned down, bent over a wooden bench in the station. His girlfriend tries desperately to fend off the suspect punching him, and then he attacks her.